This year’s soccer season started on Sunday with Cameron playing on a newly formed U-19 Old Dominion Soccer League travel team called the Clarke County Football Club. Cam and his best friend Robbie, both freshmen, were invited to join this team that’s comprised mostly of players ages 16-19, including Robbie’s older brother Charles. Most of these players were on the Clarke County High School varsity soccer team last year, so it’s an impressive step up for Cam to play with the big “kids.” I use kids loosely, since these guys are really young men, but I’m not used to using that term when describing Cam! 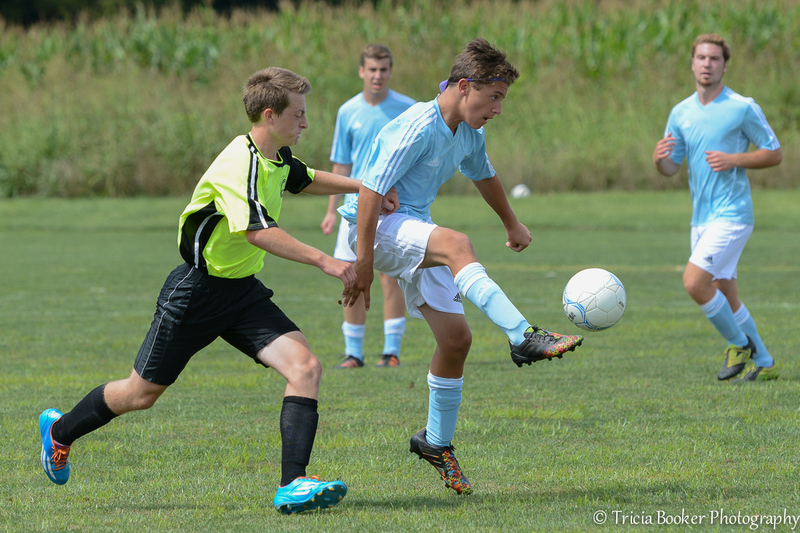 I had a great time photographing their first game, although I decided to try shooting .JPG and not RAW files to cut down on the storage space I’m using with soccer images and the Nikon D800E. Unfortunately, I quickly remembered why I prefer RAW files, as the latitude in editing is greatly reduced in a variety of ways. As it turned out, this lovely soccer field in Mt. Jackson, Virginia was surrounded by cornfields and dense woods, and the contrast between the background and the team’s brand new uniforms with bright white shorts was extreme. I played with different settings as I shot, using exposure compensation as well as different white balance settings to see what worked best. In the end, I think I’ll return to RAW, but I’ll become more discerning with the images I choose to keep. It was a useful experiment and a good time to try it, since I was a little rusty from the long break from soccer. I’m sure both the team (which lost their début game 3-0) and their photographer will improve for the next game! Thanks David! So much fun to get out there on the field again!